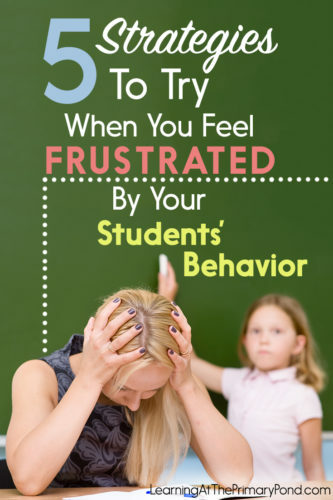 Have you ever felt frustrated by your students’ behavior? Maybe you have a difficult class this year. Or maybe your otherwise well-behaved students are getting a little squirrelly as the holidays approach. Whatever the case may be, if you get frustrated with your students’ behavior sometimes, you’re not alone. It happens to me more often than I’d like, and I know it happens to tons of other teachers too! When I’m feeling especially frustrated by my students’ behavior, I take a little time to regroup. In this post, I share 5 things I do to help get myself and my students back on track! 1. I focus on my mindset. It’s easy to focus entirely on the academic part of school. You know—the skills we have to teach, differentiating instruction, all of that stuff. But I believe that teaching appropriate behavior is JUST as important because the brightest, most highly-educated student is not going to be successful in the world if he/she cannot get along with others or follow rules! So if I expect my students to come into my classroom already knowing how to behave appropriately, I’m setting myself up for some serious frustration. Just as I wouldn’t get angry with a child for not mastering addition immediately, I would not get angry with a child for not having great behavior immediately. Teaching behavior is part of my job, and sometimes I have to stop and remind myself that. 2. I take a “scientific approach” to solving behavior problems. It’s easy to become emotionally involved and upset when your students aren’t behaving as you’d like them to! I’m sure that you, like me, want the best for your kids. You want them to behave appropriately so that you can do a great job of teaching them what they need to know. When it comes to our students’ behavior, we have a lot of “skin in the game,” so to speak. We’re emotionally invested! That said, when I’m dealing with a behavior problem, I’ve found that I have to take a few steps back and start thinking about things in a more detached, “scientific” way. Decide if it’s one student, a group of students, or the entire class that you want to observe. Then, watch closely for this problematic behavior over the course of one or two days. Write down WHEN the behavior is happening. Write down what happens immediately BEFORE and immediately AFTER the behavior. Does the behavior arise mostly in the afternoon? During transitions? Before lunch? Or another time? Is there something that always comes immediately BEFORE or AFTER the behavior? What might be triggering the behavior? Is the behavior serving a purpose, i.e., getting your attention, getting other students’ attention, avoiding work, etc.? Based upon what you find, come up with a possible solution to try (just one thing). Try it for several days. Ask yourself, “Is this working?” And if it’s not, that’s okay! Just try something different! I call it a “scientific approach” because it’s kind of like an experiment. You observe, try out a solution, and observe some more. If you’re having trouble finding time to observe and jot things down, you might ask your school psychologist or counselor to come in and do an observation. 3. I try something different. If you do the same thing over and over again to try and resolve a behavior problem, but it isn’t working, it’s probably not a good idea to keep doing it! Even if it feels like NOTHING will solve the problem, it’s still worth a shot to try different possible solutions and see if they work. Teach conflict resolution / kid-driven solution—and put a big poster of the solutions up in the classroom that you can point to when a child is tattling! And as I mentioned in #2, I only try one possible solution at a time—so I can tell if one particular strategy really works. 4. I devote time to relationship-building. If you have a challenging class, it’s easy to feel disconnected from the kids. You end up spending so much time and energy just getting through the day! Try making time EVERY DAY for a short, fun activity that you and the kids enjoy, one that helps strengthen your relationships with the kids and their relationships with each other. Simple activities to try: sharing about your weekends, playing parachute games, playing “hot potato,” reading a silly book, show and tell, or student of the week. 5. I do something nice for myself! In addition to numbers 1-4, I always try to do something nice for myself when I’m feeling especially worn down by my students’ behavior. It can be something really simple, like taking 10 minutes to read a book in the morning, going to bed a little early, buying or making something special for breakfast, planning something extra fun for the weekend, etc. If you do something that makes YOU happy, you will definitely bring that happiness (and maybe a little more patience) into the classroom. Which strategy do you think would be most helpful in your classroom? Do you have any strategies to add? Let me know in a comment—I’d love to hear from you!! I am going to start doing morning meeting to help build relationship between students and myself. What suggestions do you have for student who refuses to write? I am so sorry, Renee – that sounds like it’s a social crisis as well as an educational crisis with your students, and I think it’s amazing what you are doing for them. Are you able to use Donors Choose to get resources for them? Hi Renee. I hear what you are saying! I teach in a rural area but face some of the same challenges as you. The opioid crisis has hit us very hard and I have fosters, kids parented by grandparents and kids parented by who knows who. 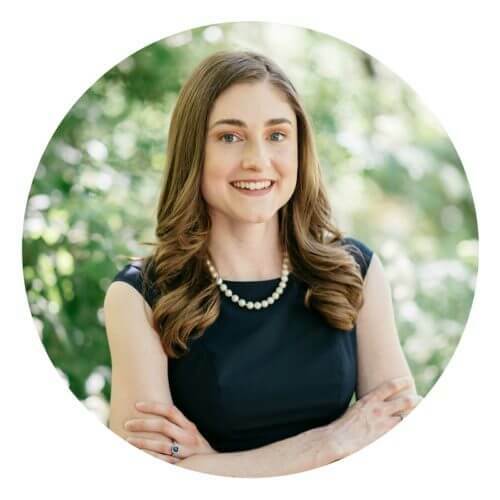 If you are still coming by here I’d be happy to swap email addresses – maybe we could share stories and how we are trying to address behaviors/encourage learning. Alison, is it possible that you could facilitate? Someone with as big a teaching heart as Renee has deserves some support! needed those simple yet forgetful reminders thanks. Thank you SO much for this post! No matter how many years we’ve taught, these issues can still be a challenge. Love the idea of the notepad for talkative children! You’re welcome, Kelly!! And that’s so true – these are always things we have to deal with! We here in Perth, Western Australia are in the middle of report writing. I certainly needed your words of wisdom about behaviour as I have had a challenging but wonderful group this year. I have an owl named “Wise Wendy” that I use for tattling. She just sits in the classroom and is there to listen to your tattles instead of the teacher. It could be any stuffed animal or character you want…saves you from hearing endless tattling. I love that, Stacey!! 🙂 Thanks for sharing this! I too have an alarmingly over active class of kindergarten boys this year. It helps to take time for yourself no matter how tired you are at the end of the day.Also even though many are not readers many are tattlers so I will use the notebook idea and the puppet idea.Many years ago I had an octopus named “Handy”. Thank you for reminding me why I love Kinders. Thank you for this gentle reminder. This year’s class has had it challenges, but this post helps me know that I am not alone in the behaviors. I am going to work on writing down patterns. Thank you so much for the reminder about self care! I’m so glad this post spoke to you, Shannon! Take care and have a wonderful holiday!! Hi. How do you feel about rewarding students with stickers and prizes for academic performance? Thank you. Hi Sara! I try to focus on helping my students feel pride when they accomplish something academically – to develop that intrinsic motivation rather than the extrinsic motivation. I use stickers here and there, but not super frequently. I really don’t use prizes for academic performance. I hope this helps – I know everyone handles this issue differently! Hi Alison, this is Renee, i’m Responding in reference to Johns response to my initial concern. John thank you so much for your insight and compassion. I’m right back in the trenches this year and prayful that it will a great school year. I was a little hurt that no one, not even Alison responded that post. So I am thankful and appreciate of your kind worlds. Hi Renee! I’m so sorry you didn’t see my response back in February! I’ll send you an email to see if I can support you in any way! I’ll be sharing this with my staff this week!